Unlike most holidays which are set to the lunar calendar, the Khmer New Year follows the Gregorian calendar - celebrated for three days, set every April 13 to 15. Neighboring Buddhist countries like Myanmar, Thailand, and Laos celebrate their respective new years on or around the same date. The Khmer New Year marks the end of the traditional harvest season, a time of leisure for farmers who have toiled all year to plant and harvest rice. April represents a rare break from the hard work: the summer season reaches its peak in this month, making it all but impossible to work for long in the fields. As the harvest season winds down, farming communities turn their attention to the rites of the New Year ahead of the rainy season that arrives in late May. Until the 13th century, the Khmer New Year was celebrated in late November or early December. A Khmer King (either Suriyavaraman II or Jayavaraman VII, depending on who you ask) moved the celebration to coincide with the end of the rice harvest. The Khmer New Year is not strictly a religious holiday, although many Khmer visit the temples to commemorate the holiday. Sok San of the Budhhi Khmer Center notes that this holiday is both a traditional ceremony and a national ceremony, but not strictly a religious one, contrary to superficial appearances. How Do the Khmer Celebrate Their New Year? The Khmer mark their New Year with purification ceremonies, visits to temples, and playing traditional games. At home, observant Khmer do their spring cleaning and set up altars to offer sacrifices to the sky deities, or devodas, who are believed to make their way to the Mount Meru of legend at this time of year. The temple courtyards also become playgrounds for the Khmer, who play traditional Khmer games during this time of year. Angkunh, for example, uses large inedible nuts (angkunh), tossed and knocked about by opposing teams. There isn't much in the way of monetary rewards to the winners - just the slightly sadistic fun of rapping the losers' joints with solid objects! How Long Does the Khmer New Year Festival Last? 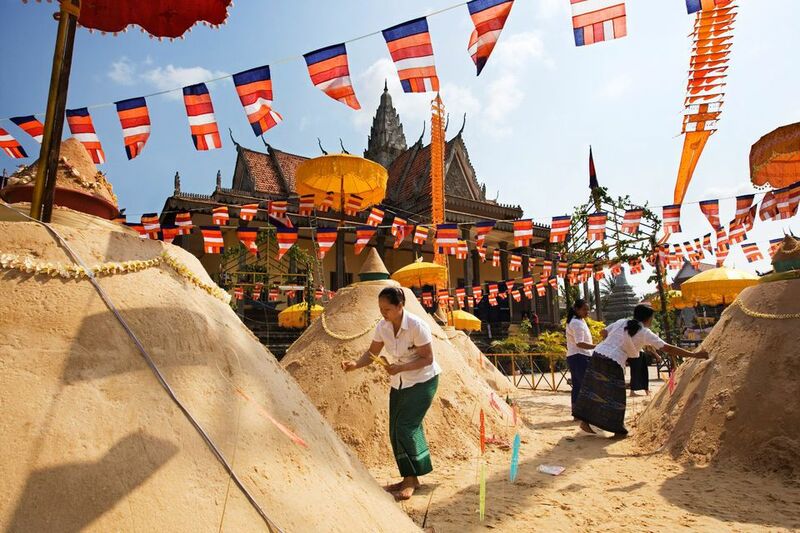 The Cambodian New Year is celebrated for three whole days, each with their own ritual significance and ceremonies. Day One - "Moha Songkran" - is celebrated as a welcome to the New Angels of the year. Khmer clean their homes on this day; they also prepare food offerings to be blessed by the monks in the pagodas. Conservative Khmer communities permit only this day for the free mingling between males and females, so Moha Sangkran is important for men and women who are looking for future spouses. The traditional New Year games offer men and women a rare opportunity to mingle. Day Two - "Vanabot" - is a day for remembering one's elders, both living and departed. Khmer provide donations to the poor on this day. In the temples, Khmer honor their ancestors through a ceremony called bang scole. They also build stupas of sand in remembrance of the dead. The stupas represent the burial place of the Buddha's hair and diadem, Culamuni Cetiya. Day Three - “Thgnai Loeung Sak" - is officially the first day of the new year. On this day, the stupas built by the Khmer in the temples are blessed. Devotees bathe Buddha statues in the temples in a ceremony called "Pithi Srang Preah"; they also ceremonially wash elders and monks and ask them for forgiveness for any mistakes made during the year. A Royal procession in the capital Phnom Penh caps off the day's celebrations, which also include elephant races, horse races, and boxing matches. Where Can I Celebrate Khmer New Year? In Phnom Penh, the best place to be during the New Year is the temple of Wat Phnom, where the Khmer congregate to play traditional games, watch traditional performances, and throw talcum powder at each other. The city of Siem Reap uses its proximity to the Angkor Archaeological Park to its advantage. The Khmer New Year coincides with the Angkor Sankranta new year celebrations, marked by exhibits of Khmer cultural arts (games, dancing, and martial arts) around the Angkor temples, and several nights of street parties down the infamous Pub Street district.